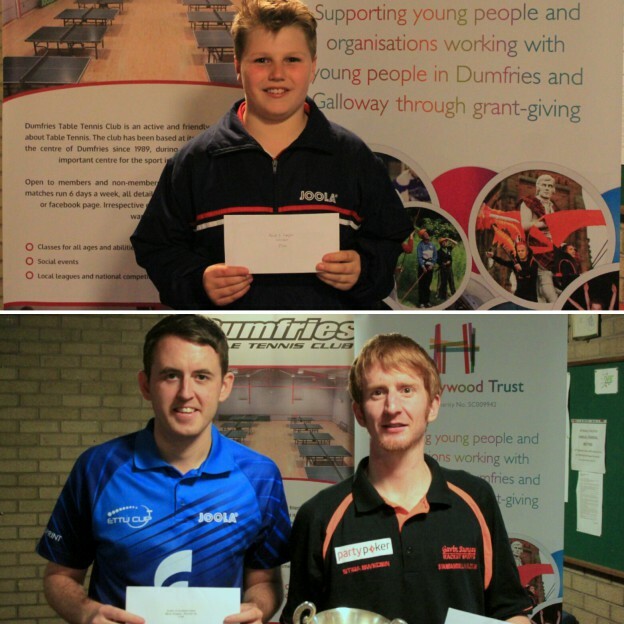 Seeded 2 in the Mens Singles, he justified his seeding by reaching the final losing to Scottish no1 Gavin Rumgay. Chris had wins over Martin Perry, John Hannah, Andy Macpherson & Sean Doherty. Chris paired up with Andy Macpherson in the Open Doubles where they reached the semi finals, losing to eventual winners Colin Dalgleish / Sean Doherty. Reached the Quarter Finals of the Mens Singles with hard fought wins over Peter Cameron, Charlie Ellis & Ethan Chapman. Andy paired up with Chris Main in the Open Doubles where they reached the semi finals, losing to eventual winners Colin Dalgleish / Sean Doherty. Reached the Quarter Finals of the Open Doubles with Dylan De Silva where they lost to no1 seeds Rumgay / Ross. Chris secured a great win over Zaid Khalid in his mens singles group to qualify into the last 16 where he lost out to Sean Doherty. Winner of the Band 2 event on the Saturday with wins over James Forrest, Harvey McDonald, Renee Ho. Winner of u13 boys event on Sunday with wins over Gutam Kukar & Charlie Morton. Semi Finalist in Junior Doubles with partner Danny Bajwa, losing to eventual winner Morton / Morrison. Partnered with Ryan Henry, they scored a great win over Ethan Chapman & Jennie Yang in Open Doubles. Robin his way to last 16 of Mixed Band 2 and last 16 of junior boys with notable wins in both events. Robin partnered with Joe Cranna reached the QF of junior doubles on the Sunday. Ryan reached last 16 of Mens Band 2 on the Saturday with a 3-2 hard fought win over Alisha Khalid. Great experience for Ryan to be drawn in the same group as Scottish Senior no1 Gavin Rumgay. Partnered with Robin Wilson, they scored a great win over Ethan Chapman & Jennie Yang in Open Doubles. Jamie started his u11’s season well, winning U11’s mixed event without any hiccups. Jamie will be looking to be dominant in this age group this season as well as challenging the top u13 players. Chad Duncan, Patric Hollywood, Kayser Collins, Owen Wilson, Grant McLellan, Holly McNamara scores still to be updated.